It's been awhile since I've had a kitty-related post, so here goes. I'm embedding a couple of cute cat-related videos from YouTube. The first one, Kitty Said What? came from Ben. When I first saw it, I thought it was the funniest/cutest thing I'd seen on YouTube (which I don't spend very much time on, so my standards are pretty low). The song totally sticks in my head! The second one, Alarm Cat, came from Kevin, I think. I think it's even better than the first one! It's so accurate! 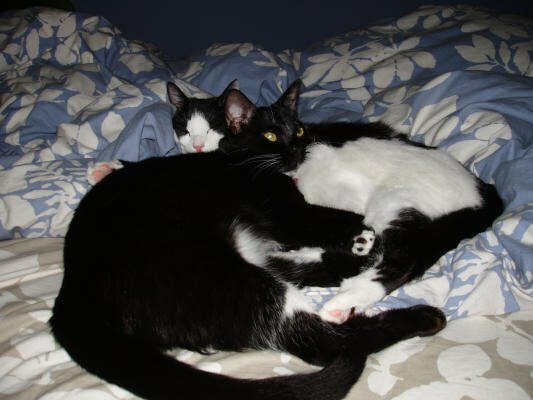 The cat in it is a cross between Pepper, who just generally likes to stomp around in bed in the morning and step on us, and Oreo, who wakes me up to force me to pet her. David had been trying to put together a "DIR" boat for some time, and he finally managed to get enough people to do an Escapade trip today. After some last minute cancellations, plus one last minute addition, it ended up being 8 of us on the boat (David, Jonathan, Cynthia, Matt, Kevin, Clinton, Rob, and me). Of course after all of the planning, the swell forecast looked sketchy. In the beginning of the week, the forecast for Saturday said something like a 15 foot swell plus really windy, but over the week it got better and better. It turned out to be a 7 to 8 foot swell plus some wind in the morning, but according to Jim, by 1 PM, it was supposed to be a 15 foot swell with 3 to 5 foot wind waves on top of that. Ouch. 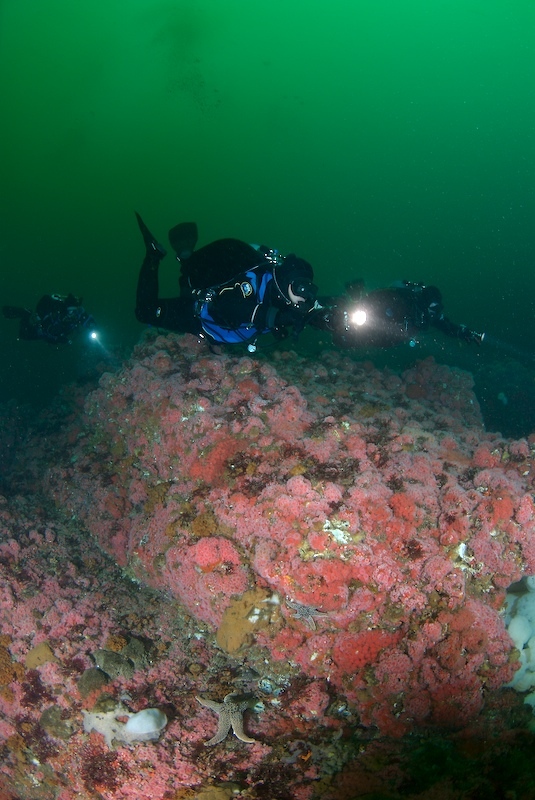 So we figured we'd see if we could sneak outside of the bay for a first dive, but it was not to be. As we approached Pt Pinos, you could tell just by looking that it wasn't going to happen. So we retreated to Ballbuster, which was fine by me. I have only dived Ballbuster once, during my AOW class. 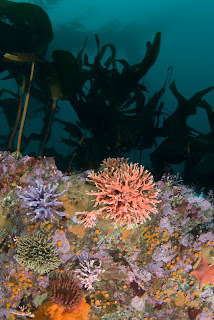 It was my first boat dive in Monterey, and I was completely terrified. I was freezing (this was in my wetsuit days), totally stressed out, and I guess rather narc'd. As a result of all of these things, I barely remember anything about the dive. It's possible that my memory has faded over time, but immediately after that dive, Rob and our instructor were talking about the gorgonian that one of them pointed out, and I had no clue what they were talking about. 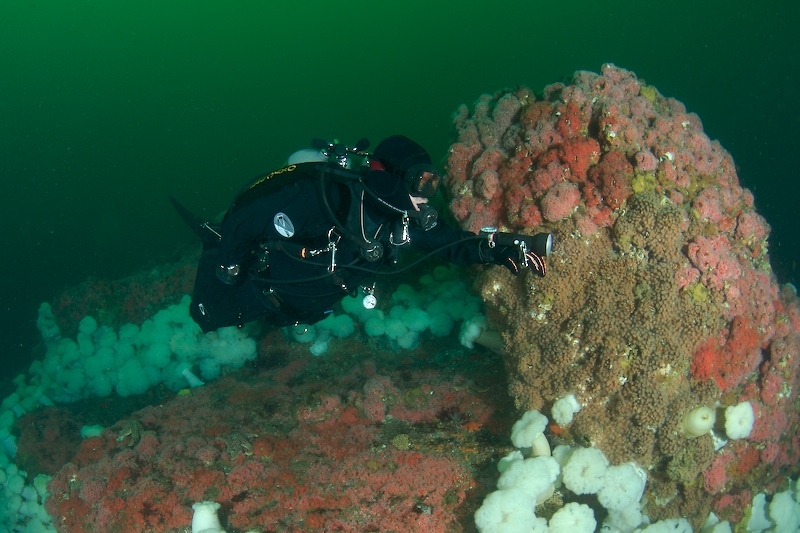 I remember that there were some Metridium, and some rocks :) So it was practically a new site for me. Rob and I were diving with Kevin and Clinton (Clinton was an honorary Team Kitty member for the day). So, as we got geared up, Jim scared us with tales of ripping currents. The boat was not blowing in the direction of the wind, so he thought that there may be some heavy current. He told us that if the current was too strong for us to stay on the site when we got down, to come back up the line immediately (or shoot a bag if we could not make it to the line). So, at this point, I was nearly as scared as I was the first time I was at Ballbuster. Rob decided not to bring his camera, because I guess he too was sufficiently frightened by the dire warnings (as a result, all of the pictures in this report were taken by Clinton). And we didn't want to dilly dally on the surface. When we hopped into the water, there really wasn't any current at all. But big swells, and craptastic viz. The waves kept washing over my head, which made rinsing my mask to defog it a challenge. Anyhoo, we got to the line and headed down. There were some moon jellies right near the surface. Then at maybe 15', we saw a sea nettle! I have never seen one before, but they are so pretty. I've been jealously reading everyone else's reports of seeing them in the bay this summer. It was really cool. The nice thing about diving at the shale was that the ride home was basically non-existent. I did my best to shove as much junk food from the Escapade junk food box (my favorite!) down my throat :) After we got back and cleaned up our gear (our stage bottles must have sprouted legs and learned to walk, as they somehow made it up from the boat to our car without our intervention -- thanks Jonathan!) we decided to walk over to Turtle Bay for lunch (surprise surprise). Yum yum. Today we dove at Point Lobos, where we went to Beto's Reef. Kevin was originally supposed to join us, but he got called into work, boohoo. So we were on our own. But a lot of the usual suspects were at Lobos too. Rob was shooting macro; the plan was to look for nudibranchs and stuff out there, since we often see some nice slugs at Beto's. Just after I had gotten geared up (gloves and everything), and was sitting on my table waiting for Rob, Susan asked me if I needed sunblock. Doh! After I claimed I would just put some on after the dive, she came running over and insisted on smearing it on my face. Now that's full service :P So, for once, I did not have sunburn after a day of diving. Anyhoo, Rob wiggled into his gear and we headed into the water. We were planning to do a second dive, possibly with Kevin, so we brought along stage bottles. Jonathan, Nils, and David put our bottles on our float, in exchange for letting them put their stuff on the float too. I don't know how the physics on that worked out... between the five of us, there were five Al80s and three scooters on a float that allegedly has 12 pounds of lift. I had made some adjustments to my harness suggested by Beto (so my right post reg wasn't digging into the back of my head). Actually Beto made the adjustments, since he has a Jedi-like ability to adjust a harness. Before I could even think through which way I needed to move this buckle or that D-ring, he had it done. Anyhoo, we descended not far from the ramp (where the viz was terrible -- couldn't see the bottom until we almost hit it), to check that everything was in order, and that I could actually put my head back without getting a dent in it. After a quick valve drill, we came back up and surface swam out a bit past the edge of the cove, and descended in 40 feet of water. Here the viz was much better -- from about 5 feet, we could see the bottom. We swam out along the sand channel, at the west edge on the interface with the reef. At some point I was looking at kelp, and I found some hydroids on the kelp, with what looked like a tiny white nudibranch. I have no idea what it was -- I don't understand how anyone can ID something that small without magnification (and Rob was unfortunately not able to get a shot of it). We made it out to Hole in the Wall pretty quickly, and while we were around there, Rob suddenly lost his ability to a) keep his light where I could see it, b) stay beside me where I could easily find him and c) not bump my fins when we were swimming. So after I had a little "talk" with him about positioning, we headed north over the sand. We came to that rock just north of HITW (which I think really needs a name of its own, since I like it a lot). Rob found a little kelpfish to take some pictures of. While he was doing that, I found a Festive Triton and a cute little sculpin. 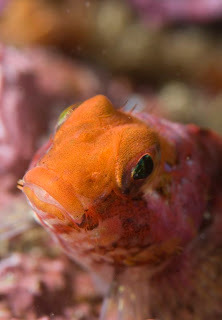 By the time he got around to the sculpin though, the fish had gotten skittish and didn't get any pictures. I was getting rather cold, so when he was finished, we picked up the pace a bit. We soon came to some rocks that Rob signalled that he recognized and knew which way to go. It's just like Rob to try to steal my thunder and claim that he got us to the site, when I had been navigating the whole time. Soon after that, we passed Seamount, and then Beto's Reef came into view. I always forget just how close the two are. We swam around the west side of the reef, looking for critters on the side. 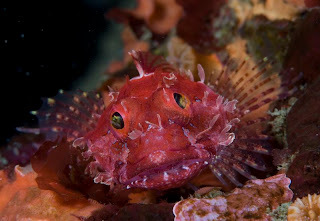 There were several cute sculpins, a couple of Aegires, more Festive Tritons, a lot of clown nudibranchs (some pretty small), and two pretty Limacia's. It seemed like everytime Rob was taking a picture, I would find two more things for him to shoot. So I would just wait around for him to finish and point out the other stuff I had found. It was pretty surgy even at 100 feet, so it was a little annoying trying to keep track of things I found. 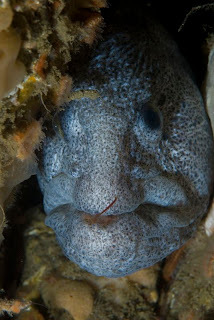 We also saw the resident wolf eel there, just before we were about to turn around. 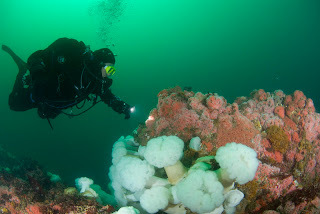 We headed up to 70 feet for the trip in, and stopped briefly at Seamount. Didn't see anything too interesting. We had tentatively planned to do a second dive with Don and Elissa (who showed up a little late, and couldn't be convinced to go on the "death swim" to Beto's Reef). But none of us felt that compelled to do a second dive, and Jonathan, David, and Nils were going to lunch. So we decided to just go to lunch instead. Those one dive wonders are always discouraging us from doing a second dive :) We were recently talking about how we only ever go to lunch at Turtle Bay and RG Burger, and really need to find some new places. So we went to Black Bear Diner, which I'd never been to. I thought it was a good place for after-dive eating and chatting. I am a fan of the extensive breakfast menu that is available all day. Oh, and they have hot chocolate, which is key for winter post-dive lunch venues. Pictures from today are available here. On Saturday, Rob, Kevin and I went to the Breakwater with Beto to do some drills, my favorite (note the extreme sarcasm). I needed to get my Fundies tech pass, so this was my checkoff dive for that. Then after that was finished, we were going to do some skills in midwater with Beto watching/videoing and giving us feedback for our theoretical future GUE Tech 1 class. So, we met up at 9 AM. We actually go there a bit early, and just after we arrived, someone left and we snagged a spot on the wall. Woohoo. We chatted with Ted, Cynthia, and Matt (sporting his new drysuit) for a bit, and also ran into John Yasaki. 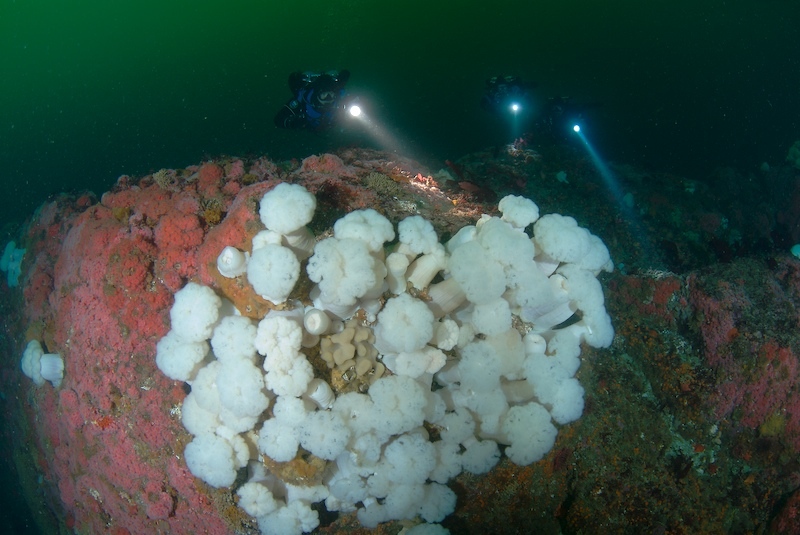 We all noted that the viz at the breakwater looked terrible, but unfortunately we were stuck there. While we were gearing up, ba_diving regulars Carol and Larry came over and introduced themselves. Carol also writes weekly dive reports, and I think we have exchanged email before but never met. There were also a bunch of BAUE people doing some survey practice. Beto and Kevin eventually showed up and we chatted about our plans. Then we got dressed and headed down to the beach (where our gear was laid out on our tables). Rob and I got into the water after we got our suits on to cool off. While we were killing time on the beach, I noticed out of the corner of my eye that Ted was standing on the beach with some fins that were, umm, clearly not his fins (a little too colorful for Ted fins). Then we realized that he was bending over (with his doubles on his back) to help someone who had wiped out on the beach. The person was waddling out of the water with their fins on (why do instructors teach people to do that? ), and once she wiped out, Ted pulled off the fins and was helping her up. I guess she was there with an instructor, and next the instructor (who also was waddling out with fins on) wiped out. I guess this was the portion of the class where they teach you an alternate exit technique which you will never actually use :) Rob helped the woman back up the beach and then Ted helped the instructor up. This story didn't make it into my original report, but Ted complained that his daring rescue wasn't covered. I thought that this report was lacking, so I decided to add the story. We finally got into the water and swam out to about 30 feet. I had to do all of the kicks from fundies and the usual drills (basic 5, valve drill, S drill), then shoot a bag and lead a min deco ascent. Then we went back down and I did a backup light deployment and an out of gas ascent. Rob and Kevin just watched, and I occasionally yelled at someone who fell out of position to show my "leadership" skills :) Okay, actually Kevin shot a bag when Rob and I were doing an out of gas ascent. So, after all that was finished, the real fun began. We were going to practice valve drills and S drills in 20 feet of water, and then do a 6 minute ascent. First we went to the bottom to do a little search for the mask that Kevin dropped during our debrief on the surface. Unfortunately we did not find it. We suspect sabotage by Kevin's backup mask, who is very jealous of his primary mask. So, we went back up to 20 feet, and the viz was terrible. Above 20 feet, there was this layer of algae, I guess, which was reddish-yellow. Besides looking disgusting, it also meant that we essentially had to stay in touch contact above 20 feet. So we went down to 25 feet, which wasn't much better. Kevin did a valve drill, and then I decided that the viz was too bad for me to actually see what the others were doing, so I thumbed it. The ascent was pretty interesting, given the viz. We were in a triangle and everytime I back kicked to go up, Kevin would wave me back towards him :) We swam out further, hoping that in deeper water, the viz would be a bit better. We decided that we'd go deeper so we could actually see each other, but still far enough off of the bottom to simulate midwater. We descended in about 45 feet of water, and then ascended back up to about 35 to do drills. At this depth, we could not see the bottom. And it was dark. Really dark. Basically a night dive. We had to shine our lights on all of our hand signals, and the lights illuminating particles made it pretty hard to see areas around everyone's lights. But it was doable. So, we each did a valve drill, and then an S drill, and then did the 6 minute ascent, which was interesting given that the viz was even worse than the previous ascent. We were literally fist to fist in a triangle as we ascended. After having to skip the BAUE boat yesterday due to a cold, I decided to head down to the Breakwater since I was feeling a bit better today. We met up with Ted and Nils to do a dive to the Metridium Field. 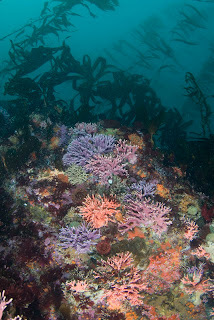 I have been dying to dive the Metridium field for a while (I haven't dived it except at night since May), but since Rob manages to get reservations for Point Lobos every weekend we aren't on a boat, that hasn't happened. We finally didn't have a Lobos reservation (thank goodness) so I insisted on the Metridium field. 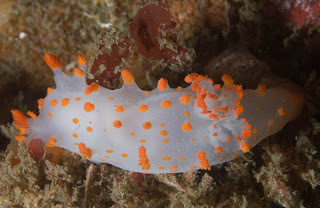 We often see interesting nudibranchs and other small critters on the pipe and in the sand on the way out there. So I wanted to do a dive where we looked for little things. We met at the Breakwater a little before 9, and I was shocked to find it pretty empty. We got a parking spot halfway down the wall at 8:45! We put our tables down on the beach, and in between crapping around, we slowly moved our stuff down there and then got dressed. Unfortunately, we waited long enough that it got pretty sunny and hot out, so we were roasting in our drysuits. After a group bob in the shallows to cool down (during which Ted ran around splashing us like a little girl -- Nils's words, not mine), we did the GUE EDGE (longest pre-dive briefing of my life... I think we need a talking stick, so I can withhold it from Rob). When we got to the last E (for environment), Nils pointed out that he drives a Prius :) Ted and I were team 1 (I was leading), and Nils and Rob were following us. Rob suggested I do a valve drill (grumble... I was planning on it anyway, but so thoughtful of him to insist). And Ted and I both wanted to shoot a bag, so we decided that right before the ascent, we would buddy swap, so we each could :) So, we headed into the water, ahh, nice and cool, and started to swim out. When I turned my light on, no love. It just flickered very weakly and died. Boohoo. So Rob insisted I take his. We went to all the trouble of him removing it from his harness and giving it to me, and in the time it took us to do that, his died. It was on when he first started to hand it to me, but off when I looked at it after putting it on. That was so annoying! Now I had two lights clipped off, which was seriously crowding the area around my right D-ring. Anyhoo, we finally descended in about 25 feet of water, and I quickly did a valve drill. I was relieved that I was able to clear my ears... would have been pretty annoying to get all the way out there and find that I could not. The viz was pretty bad, very chunky and green, maybe 10 to 15 feet. We headed for the pipe, and found it pretty quickly. I was a little sad that I didn't have a decent light, since I wanted to look for little critters. Just as I was thinking I wouldn't be able to find anything with my crappy backup light, I found a little Flabellina trilineata on a piece of kelp on the pipe. I pointed it out to Rob, and he took some pictures. Required a bit of a team effort... I think Nils was holding the kelp leaf in the right position. We kept heading out on the pipe, and I noticed some little hermit crabs with barnacles growing on them. The pipe was actually pretty barren, but there were tons of dock shrimp skitting around on it -- I didn't notice them for a while, then after I saw a couple, I realized they were everywhere. There were also some cool feather duster worms growing on the pipe. I also noticed a decent amount of orange lacy bryozoan in small clumps all along the pipe. At some point on the pipe, I decided to try my two lights again and see if either wanted to work. When I turned mine on, it came on, and I was delighted, and when I went to put it on my hand, it was dead again :( I actually thought I may have imagined it being on, but Ted later confirmed that it came on. No luck at all with Rob's light. Ted wanted to see some Dendronotus (or actually, he wanted to see one swimming), but I didn't see any along the pipe. Their eggs were everywhere, however. 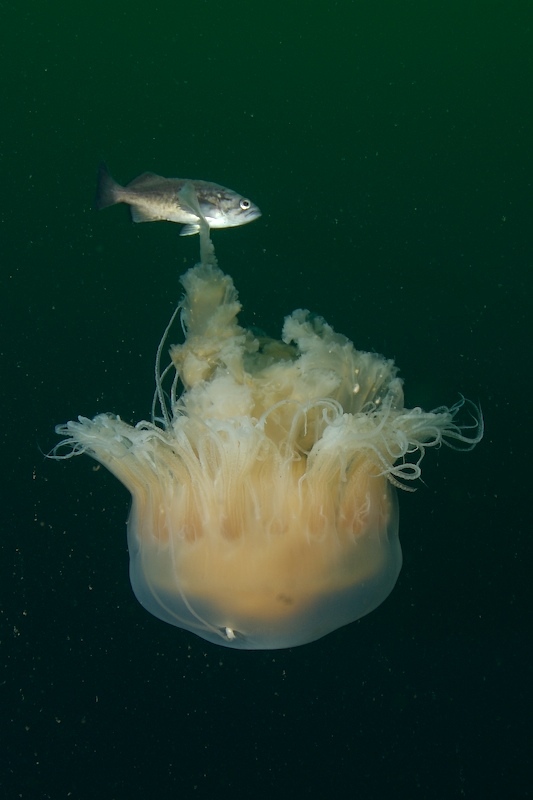 We did see a moon jelly along the pipe (or maybe two) and some other type of jelly that I have never seen before. We periodically stopped along the pipe to wait for the other team to catch up (they were both taking pictures). When we got to the end of the pipe, after chasing a moon jelly, we got kind of bored, so Ted asked me to watch him do a valve drill. What a dork. When the others finally caught up, we headed out to the Metridium field. Very shortly after leaving the end of the pipe, I spotted a nudibranch that I have never seen before. But it just looked so familiar. I was super excited to find a new nudi, and Rob was even shooting macro. I don't think Ted and Nils were quite as excited, they didn't do the chicken dance with me and Rob (see Discover California Diving for more information on the underwater chicken dance). 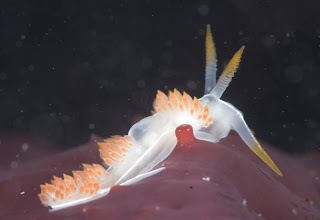 It turns out it was an Acanthodoris brunnea. 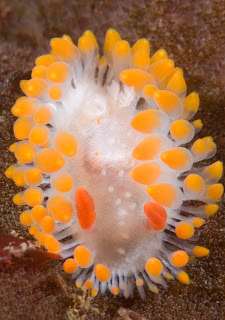 It is the first nudibranch on Clinton's nudibranch page, which is why it looked so familiar! After some picture-taking, we continued on. I was looking for stuff in the sand so closely, that I almost didn't see the big rock of Metridium as we came to it. Below about 35 feet, the viz had opened up quite a bit, to maybe 30 feet. We hopped from rock to rock, heading in the north-ish direction. The Metridiums were all open and looked happy. I continued to look for little critters. 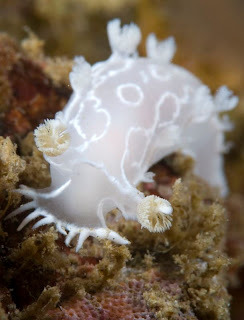 There were a lot fewer nudibranchs out there than usual. 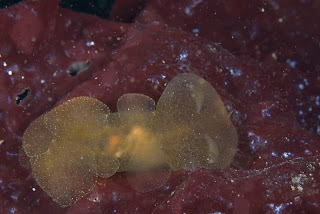 I saw one Triopha catalinae, and one Doriopsilla (usually there are so many more boring nudis). 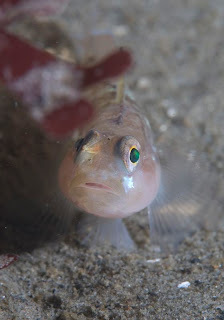 I also found a cute little sculpin, but it was at an odd angle in a crack, and Rob was about to switch off of his stage bottle, when I showed it to him, so he didn't get any pictures. After some tinkering on the surface, we found the problem with my light. The bulb had become unseated, so it was just barely making contact. That is why it would come on and then go off. That was easy enough to fix. Rob's light just worked on the surface. I have no idea what the problem was. When we got home, Rob immersed it in water and let it run for a while, and it was fine. Rob asked some pointed questions to get to the bottom of it, most of which insinuated user error, but in the end, we don't know what the problem is. I think it is time for a new light. I am sick of my crappy 10W H light -- I think I will go for a 21W Salvo. Dive 2 was at Turtle Bay, where we discussed canister lights, and made fun of Ted's Cave Diverness (he is a Global Underwater Line Follower, as Nils pointed out). Mrs. Kitty was too sick to dive today, so naturally I stayed home to nurse her back to health.... hrmmm, no. Actually, I hopped on the BAUE boat that was originally slated to be a long-range recreational charter. With conditions reports earlier in the week reporting up to 10' swells and possible gale-force winds, I didn't have the highest expectations. In fact, I was half expecting the boat to be cancelled. But no, the boat was a go, so I packed all of my gear, double-checked the bonine, and headed down to meet the Escapade at K-dock. On the way out, I decided to try my luck at sitting up in the flybridge for the ride out, hoping that it would be easier on the stomach. I think it probably helped being further away from the engine exhaust and having a panoramic view of water. As we motored out, we heard a call come in over the radio that the Monterey Express had a medical emergency on board with one of their divers. They decided to pull their hook and motor back to BW to meet EMS personnel, and in the mean time asked us to pick up their remaining divers. We pulled the remaining 4 divers out of the water and ferried them back to K-dock without hearing much more about the incident that transpired. I later heard that the person involved was awake at the dock and appeared to be ok, for what it's worth. So... after the false start, we headed out again. We ended up going around the corner and were treated to a fairly large pod of dolphins (common, pacific whitesided and Risso's) on the ride down and ended up settling on Outer Pinnacles for dive 1. By this time, the longer boat ride (having to double back to K-dock) was taking it's toll on my pathetic stomach. As a side note, I wonder if my pitiful sea legs are a sign of getting old... I never used to get sea-sick when I was younger... sigh. Anyway, Mark and Dionna had graciously offered to take me on as an orphaned buddy, so the 3 of us teamed up and dutifully did our GUE-EDGE. 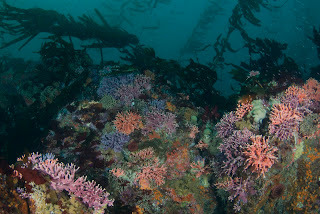 I packed wide-angle today, so I was really hoping for some nice (or decent anyway) hydrocoral shots. 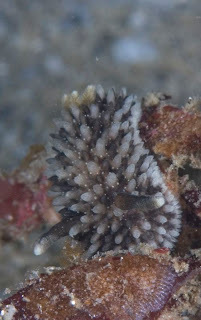 Stylaster californicus has a special place in my heart. The conditions were pretty good for dive 1, especially considering the dire-sounding forecast. There was noticeable surge down to about 80' or so; nothing too terrible, but just bad enough to make photography a pain. We swam around the site and did a couple loops around the main canyon running through there. There were a couple nice patches of very bushy and healthy-looking hydrocoral, and everywhere there were swarms and swarms of krill (I think...). We each brought stages so we'd have plenty of gas for dive 2, but just a few minutes after we switched off, our fleeting bottom time was up, and we headed back to the anchorline. 105ft, 51 minutes, 55 deg. As soon as we got back on the boat, I started projectile-vomitting. During the 10' hang, I started feeling very nauseous because of the large swells. I've never had this happen to me before, but it wasn't very pleasant. Of course, being a typical guy, I decided I could "stomach" it and tough it out. Also, I think I got a little cocky because I had taken bonine, so I helped myself to multiple pastries in the morning, and was now paying for it in spades. Anyway, the surface interval was kind of a blur (though rumor has it that it involved birthday cake), as I spent most of it hunched over the starboard-side gunwale. When I came to, we were anchored over Ballbuster and gearing up for dive 2. Dionna sat out dive 2, so it was just Mark and me. We dropped down to the pinnacle and started circling it around the 80-90' range. I'd only ever been on Ballbuster once or twice before, and my first thought was that there were a heck of alot more metridium here than I remembered. The pinnacle itself isn't that large, and we ended up circling it several times before finding ourselves back on top at around 60' or so and met up with the rest of the teams there. I was running deco this time and due to my pitiful stomach, moved the stops around to spend more time at 20' and minimal time at 10' (although by this time, the swell had really calmed down quite a bit). I didn't do as well as I'd have liked picture-wise on the day, but I put up a few here as well as some better work by Mike and Clinton.